Allen Boles gave it his all last year, but try as he might, he couldn’t catch eventual champ Ricky Rude (#14). This year may be different. In a tight finish, Boles (#3) captured the checkered flag in Saturday’s Bandit Big Rig Series feature at Mobile International Speedway. For his efforts, Boles stole a $10,000 check, as well as bragging rights. Boles held off Tommy Boileau (#16), newcomer Mark Noble (#74) and Tyler Kruckeberg (#54), who earned a top-five feature finish for the first time in his career. “I was very happy for all these Bandits and how much they put into their trucks during the offseason,” Bandit general manager Jason Johnson said. Despite Saturday being a makeup date for rain, the event saw a near-capacity crowd take in all the action. In addition to Boles’ feature win, Saturday saw the debut of a special event – an Australian Pursuit race, which features two Bandits going head-to-head for just one lap, with the winner advancing to the next round. When all was said and done, Boileau was the only Bandit left standing. “The Australian Pursuit race was filled with action,” Johnson said. “Very impressed the Bandits kept it clean with nothing but bragging rights on the line. 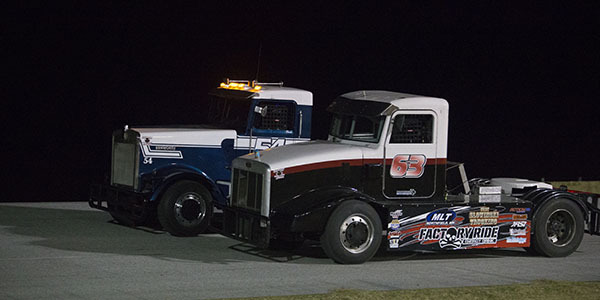 In addition to all of the racing action, Minimizer sponsored the Fan Series Truck Show. Next up is a return to Hickory Motor Speedway. Bandit fans packed the ‘World’s Most Famous Short Track’ last year, and organizers say they expect more of the same next month. Tickets for the next race at Hickory Motor Speedway can be purchased online. The Minimizer Fan Series Truck Show starts at 2 p.m. and the green flag drops at 7 p.m.